Posted by Alex Tomchak Scott in English soccer, Italian soccer, Spanish soccer. The transfer window will snap shut Wednesday, but before it does, there are a few things I’d like to see go down. I’ll go over some of them for you. When Stephen Ireland moves to Anzhi Makachkala, it will be Samuel Eto'o performing the japery. After accepting a drink from a shadowy man with a thick accent and a thicker mustache in a trendy Birmingham nightclub, Stephen Ireland wakes beneath a soiled newspaper in a dusty Moscow subway station. His cell phone rings and its his agent, demanding to know why he signed for Anzhi Makachkala. His girlfriend has left him, his life is in tatters, and to make matters worse, on the training ground the next day, Samuel Eto’o delivers even more bad news: this time his gram really is dead. Ireland, surprisingly, is gutted, and his despair over his grandmother, plus the Cameroonian striker’s obvious distaste for him, make the next six months a living hell. Eto’o, for his part, obviously disdains Ireland’s chrome-plated lifestyle and passes up no opportunity to play cruel jokes on the hapless playmaker. But one day, Anzhi finds itself 4-0 down at halftime against Zenit St. Petersburg and Eto’o puts his hand on Ireland’s shoulder in the changing room. Ireland is overjoyed, and he and Eto’o each bag a hattrick in the second half, catapulting Anzhi into first place. Glad for the second chance to reconnect with his gram, he buys her a mansion in Moscow and he and Eto’o are over for tea after practice every weekday. It’s good for everyone; Eto’o’s burning desire and fierce intelligence have rubbed off on Ireland, making him not just one of Europe’s finest playmakers but a respectable man. Ireland’s gram finally feels like people aren’t constantly treating her as if she’s already dead. As for Eto’o? He has found love. He proposes to grandma Ireland on the podium at the Champions League final and they live happily ever after. 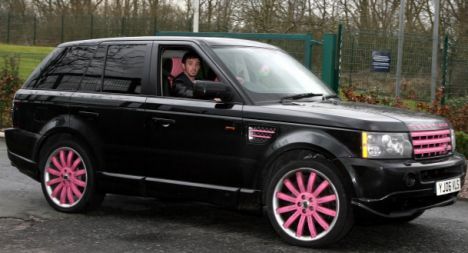 It turns out well for Roberto Carlos, too, because Stephen Ireland gives the World Cup winner his garishly customized SUV, … and only then does the Brazilian realize a Range Rover with pink hubcaps is the only thing he ever wanted. With Arsene Wenger now the worst coach of all time, it’s clear that what Arsenal really needs is someone to kill him. Forest Whitaker’s character in Ghost Dog: Way of the Samurai, the 1999 film by Jim Jarmusch has a well-documented inability to learn French. His love of exotic Japanese methods would quickly win him Wenger’s trust, but he has a proven history of turning on nebulously foreign employers whose leadership he can’t trust. Let’s be honest, these two were meant to be together. The Swede’s title-winning mojo is really the only thing Arsenal needs/the Gunners’ only hope.